According to the Haggadah (Men. 29b), Akiba found a significance in every little ornament or flourish upon the letters of the Torah; to him therefore a Midrash has been ascribed, which treats of the little curves or embellishments upon the extremities of Hebrew letters, and also of the single letters found in the Hebrew text of Scripture of a different size from the others. This small Midrash forms a kind of supplement to Akiba's Alphabet, which treats of the names and shapes of the letters, and it is not improbable that both of them are portions of a larger work of which other parts are lacking. "כ (Bet) has two strokes connected by a stalk, representing the earthly and the heavenly judgment places (bet din), which, despite intervening time and space, are yet one. "ל (Lamed), the tallest letter, has its head bent downward, thus representing God, who is exalted above all and still looks down upon us. "Why is the (Yod) in (Num. xiv. 17) written large? In order to indicate that God's mercy is so great that it extends over all the inhabitants of the earth." The first edition appeared in Abraham Portaleone's "Shilṭe ha-Gibborim," p. 177, Mantua, 1613, with annotations by the editor. It is also to be found in Bartolocci's "Bibliotheca Rabbinica," iv. 275, edited from a manuscript belonging to the duke of Parma. These two editions, together with that published in Jellinek's "B. H." v. 31-33, from a manuscript of the year 1398, contain only the portion concerning the ornaments of the letters. 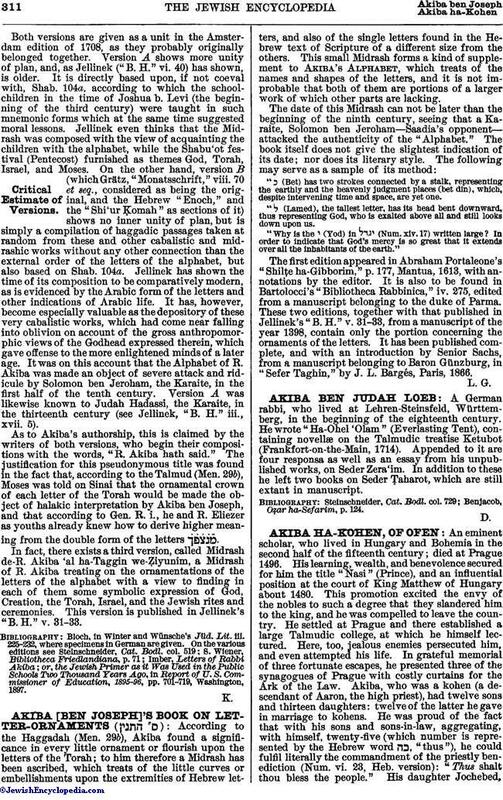 It has been published complete, and with an introduction by Senior Sachs, from a manuscript belonging to Baron Günzburg, in "Sefer Taghin," by J. L. Bargés, Paris, 1866.